Orting is a quiet community nestled amidst the evergreen forests of the American Northwest. 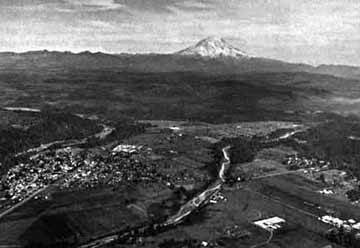 This aerial photograph shows the physical setting of the town on the fertile floor of the valley carved by the Carbon River (at left) and the Puyallup River (at right). At this point, the valley is a long trough bounded by steep banks several tens of meters high. This view, across the valley to the southeast, shows how majestic Mount Rainier, about 80.5 km away, dominates Orting's horizon. The floor of the valley is covered by several successive mudflows that originated from Mount Rainier. Compare this photograph with the Map of Orting in the map section. Photo: Lyn Topinka.